“Orbs, Shapes & ‘Scapes,” featuring the work of Yadi Flannery and Martha Flannery, Santa Fe, N.M., and Nancy Henry, Prairie Village, Kan., opens at the Lincoln Art Center, Saturday, July 2, from 5:30 - 7:30, with a gallery walk at 6:15. This exhibit runs through Aug. 30, 2016. “Orbs, Shapes & ‘Scapes,” featuring the work of Yadi Flannery and Martha Flannery, Santa Fe, N.M., and Nancy Henry, Prairie Village, Kan., opens at the Lincoln Art Center, Saturday, July 2, from 5:30 – 7:30, with a gallery walk at 6:15. This exhibit runs through Aug. 30, 2016. The connection between the three artists is the interest they all have in design, texture and tone. Each of these artists create works that speak about experimental works from an internal, rather than external experience, to express some aspect of their world. Yadi Flannery now lives and works in Santa Fe after spending three years on a farm near Beloit, Kan. “My work is Alternative Medicine, my alternate life is a quilt artist beginning as a teen.” Yadi’s work has been shown in various venues in New Mexico, Colorado and most recently at the Lincoln Art Center. This new body of work takes a “collage” approach incorporating scraps of fabric, clippings and throwaways largely untouched and pinned and stitched loosely. Yadi credits her inspiration for the collage quilts to the year long attendance at the Lincoln Art Center’s “open studio” on Tuesday evenings. Nancy Henry began her exploration into painting in 1991 with watercolors, and has since moved into pastels and acrylics. 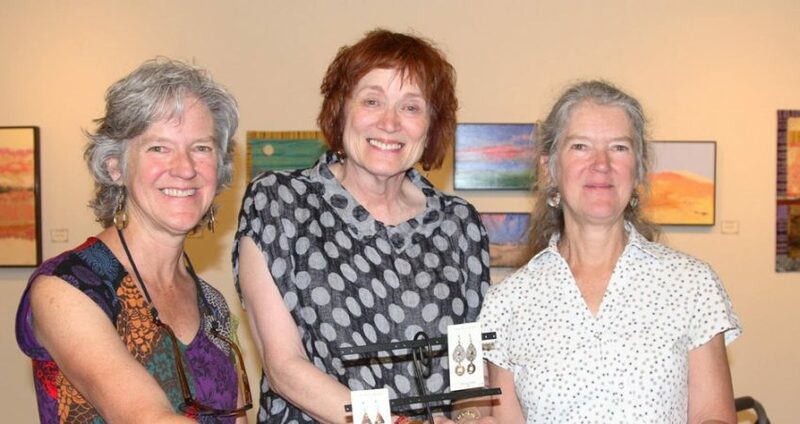 Her work has been shown in the Peterson Gallery in Santa Fe, galleries in Rociada, N.M., and Las Vegas, N.M., as well as many other shows and exhibits for several years. Nancy and Yadi have collaborated to focus on using color and arrangement of color in new expressions of landscapes. This exhibit is free and open to the public Tuesday-Friday, noon-4:00 p.m., and Saturday, 9:00 a.m. to noon, at the Lincoln Art Center, 126 E. Lincoln Ave., Lincoln, KS 67455. For more information call the art center at 785-524-3241 or visit lincolnartcenter.org. New in 2016, the Lincoln Art Center began offering a monthly wine and paint class, called "Gogh Paint." Call to reserve your seat for the next class!